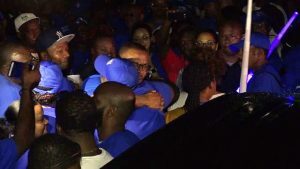 NIA CHARLESTOWN NEVIS (December 19, 2017) — Premier Elect of Nevis Mr. Mark Brantley, addressed supporters moments after the Concerned Citizens Movement was announced winner, after the preliminary count in the early hours of Tuesday morning December 19, 2017. The following is the text of his address. 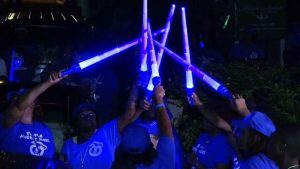 “I want to thank this gentleman Vance Amory, a Nevisian stalwart because if it wasn’t for him we wouldn’t be here where we are. I want to thank everybody, all the supporters who did a wonderful job today, all the workers, the people rallying with us, magnificent campaign we waged and I am very grateful to everyone for that. “Tonight we rally and we are going to have a good time. Tomorrow is a public holiday, I have spoken to the Honourable Prime Minister. “We will announce when we have our motorcade, we have to do that because CCM people love to have fun and we have to get together and celebrate because this is an historic day for us. “As I drove up the road I saw a sea of blue. I did promise you we would have a blue Christmas and so ladies and gentlemen, my heart tonight is full. I am absolutely grateful to you for your support. 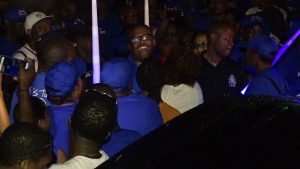 We have created history today because you went out and voted in overwhelming numbers, to deliver a crushing defeat to our opponents but it was not just a political defeat, it was also a defeat of the negativity and the vitriol and the nastiness and you have said with your vote that you wanted a different tone for Nevis. “I want to thank the Hon. Vance Amory because without him, none of this would have been possible. He is the one who built the foundation on which we now stand. Vance Winkworth Amory, thank you. Thank you for your service. Thank you for being the man who you are because you have allowed others now to come and because of you, I am standing here at this moment tonight in the very crossroads of our history. “I am very grateful ladies and gentlemen. I am humbled. I am happy. I am exhausted. I have all these emotions going on but the one thing I know most of all, is that I am committed to the people of Nevis. Nevis I will serve you. Nevis I will never disappoint you. “I want to thank my wife Sharon… and I want to thank her for being at my side and always being there. The sleepless nights, the encouragement and my family, my two daughters who are here from England. “I want to thank all of my family members, my sisters, brothers, aunts everybody came out. In fact, you know what, we are all one CCM family and I want to thank each and every one of you. “I want to thank the team, those who drove and brought water and food and those who stayed for the long hours in the polling stations, in the counting stations. I want to thank them from the bottom of my heart and my own team. I have people I grew up with, people I went to school with – people like Astro and Sam and Nutsy, people like Saunda and Troy. I could go on and on and on. “I am sure if the others were here, they too would list the members of their team. If I start to call all the members of my team I would be here all night. I want to thank them. Thank them for the work that they did in delivering this historic victory for the Concerned Citizens Movement. “This is a victory for CCM but more than that, it is a victory for Nevis. We now have an opportunity to go into the Christmas season and I am saying now we must heal Nevis. There’s been a lot of division and divisiveness. Political campaigns by their nature are divisive but we now have an opportunity to really put good meaning and real meaning to the idea of Christmas, the sentiment of Christmas. “So let us now live with each other as Christ would have us live with each other and let me ask God’s blessings upon us as a new leadership for Nevis but for also upon the island of Nevis. We cannot do it without God’s blessings and I ask you to pray for us, to pray for Nevis, to pray for your premier, to pray for the Cabinet. To pray for good leadership, decent leadership that would take us forward. “Ladies and gentlemen, I know you are tired of all the speeches and I am pretty sure we will have more to say on other occasions. I don’t know where the honourable members of the team are, the candidates because the crowd is really thick here at 3 o’clock in the morning. “I want the team, if they are here, to join me please because this moment is not just about me, this was a team effort and if they are here I want them to come forward and be a part of this…but please wherever they are could you give them a round of applause. 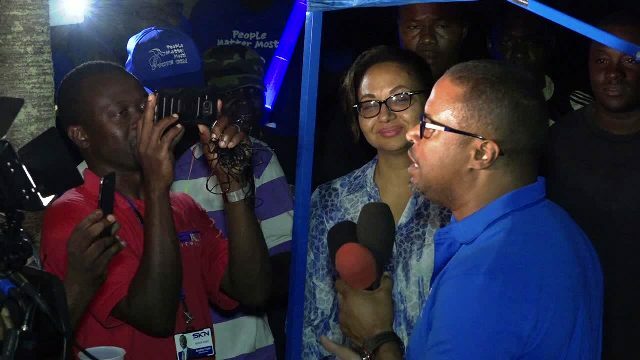 CCM family, Nevis… let me hear you make some noise..
“I spoke to the honourable prime minister on the way here and I said to him, ‘PM the people of Nevis have worked hard today. The people of Nevis are exhausted. The people of Nevis say they want a day off’ and so, he will instruct His Excellency the Governor General. So tomorrow no work in Nevis. “Tomorrow you have a day off in Nevis. Tomorrow at the appointed time and at the appointed hour, we will motorcade up and down the length of Nevis. That is our tradition and we will continue to do that. “So that has been the position and that has been expressed that today, we will have a public holiday and we ask you to listen out to know where we will motorcade from but certainly, we will do something in the rich tradition of the Concerned Citizens Movement. Ladies and gentlemen, Eric Evelyn, Keith Scarborough, Spencer Brand… Alexis Jeffers our new deputy premier, your new team. I look forward to serving you. We look forward to serving you. Nevis, God bless you.